It would be hard to understand if we would say we are dead yet are alive, but spiritually this is more than possible by the power of God. For the same Spirit which raised Christ from the grave dwells also in those who believe by the faith they have in Him. 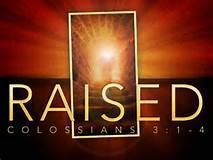 (Colossians 3:1-4) If ye then be risen with Christ, seek those things which are above, where Christ sitteth on the right hand of God. Set your affection on things above, not on things on the earth. For ye are dead, and your life is hid with Christ in God. When Christ, who is our life, shall appear, then shall ye also appear with him in glory…… (1 Corinthians 15:42-44). The apostle Paul knew God has the ability to call His people to Him, also to anoint and seal them with His Spirit. There is truly nothing that is impossible to the powerful and awesome God we serve. (2 Corinthians 1:20-24). For all the promises of God in him are yea, and in him Amen, unto the glory of God by us. Now he which stablisheth us with you in Christ, and hath anointed us, is God; Who hath also sealed us, and given the earnest of the Spirit in our hearts. Moreover I call God for a record upon my soul, that to spare you I came not as yet unto Corinth. Not for that we have dominion over your faith, but are helpers of your joy: for by faith ye stand.